The Assessment Statement (going live on 22 September) will provide students with the formal and consolidated course view of the summative tasks and sub-tasks that contribute to their overall award. The statement will show assessment dates for the current and previous years, and students will be able to access the statement via My Student Record > My Assessments > Assessment Statement. Staff can access any student’s statement via SITS Online > Module Delivery and Assessment > Assessment Statement. If a student has an approved extension, the agreed extension date will be displayed next to the original deadline date for the task. For coursework set over a date range (e.g. group work) of assessment, the date of the last assessment in the range will be the one initially published in the Assessment Statement. Exact dates for each group assessment need to be confirmed by the Module Leader in advance of the assessment and should be provided to faculty Helpdesk teams so this information can be added to SITS and display in the students’ statement. If a student is referred or deferred in a task, the date for this will be shown in the statement as soon as the students mark has progressed through the assessment boards and reassessment is confirmed. At start of year, exam deadline dates will not show in the statement, only that an exam is part of the assessment for the module. Exam periods will be accessible from the academic calendar and this will show the date range of when exams will be held. The specific date for each exam task will be confirmed in the assessment statement following publication of the exam timetable. The student’s exam schedule can also be accessed through their personal exam timetable and this is their primary mechanism to access exam timetable information. The Blackboard Calendar (accessed via the Student Assessment Channel on shuspace) provides a consolidated course view of all tasks that have a deadline date in the module sites that students are enrolled to. This includes summative tasks that contribute to the overall award, formative tasks that are used to support learning and any non-assessed tasks such as DBS checks or risk assessment forms. The Blackboard Calendar should also be used to publish deadlines for assessments completed outside of Blackboard and feedback return dates to students. For coursework assessments set over a date range (e.g. group work), the date of the last assessment in the range will be initially the one showing in Blackboard and in the Calendar. Exact dates for each group assessment will need to be confirmed by the module leader to the cohort. Approved extension dates will not show in the Blackboard Calendar. The extension deadline date will be confirmed to the student via email but students will be asked to submit their work to the original submission point which will remain open. Exam tasks will not show in the Blackboard Calendar but can be seen either on the student’s Assessment Statement or via their personalised exam timetable. If a student is referred or deferred in a task, the date for this will be shown in the Blackboard Calendar as soon as the students mark has progressed through the assessment boards and re-assessment is confirmed and the Module Leader has made the re-assessment task available. 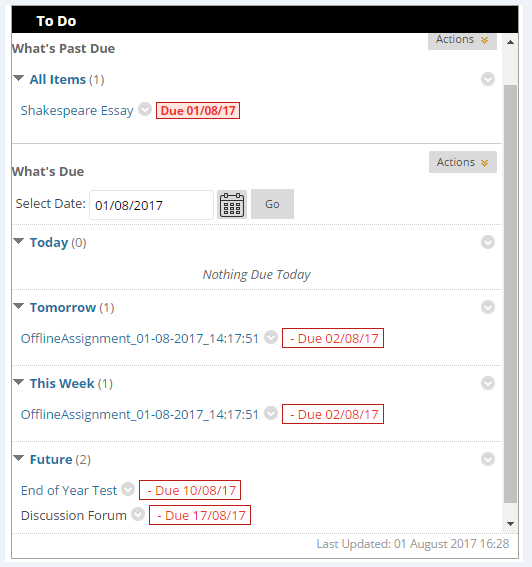 The To Do list (available on shuspace) can help students manage and organise their time. This provides a chronological list of upcoming (or missed) deadlines. 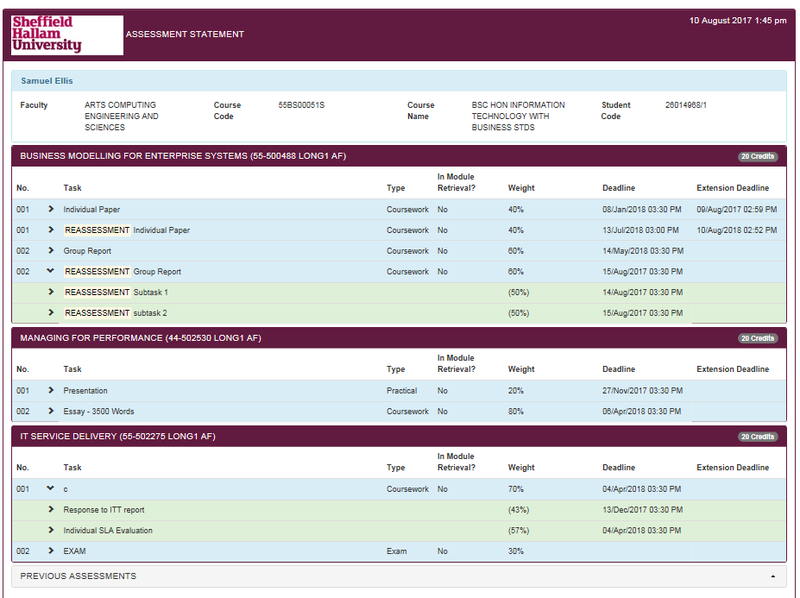 The Needs Attention Channel alerts staff when an assessment has been submitted or completed by students in a module site. When an assignment, test, or wiki, blog or discussion forum has been submitted or completed it will appear in the Needs Attention Channel along with a direct link to access and grade the submission. You can add this notification to any module site’s Home Page by selecting Add Module Channel and clicking the Add button below Needs Attention. A screencast overview for staff of the Blackboard scheduling and notification tools is available to view on Medial or YouTube.